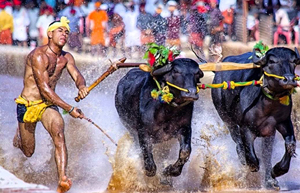 Bengaluru,Feb 7, 2017: A Bill to pave way for Kambala, the traditional buffalo race held in the coastal districts of Karnataka, will be tabled in the Legislative Assembly in two days, Law Minister T B Jayachandra said on Monday. Speaking to reporters in Bengaluru, Jayachandra said the Prevention of Cruelty to Animals Act (PCA), 1960, will be amended to include Kambala and bullock cart race as “traditional sports”. At present, an interim stay by the High Court of Karnataka does not allow Kambala to be organised. The state government has been under tremendous pressure during the past few days to take steps so that Kambala is allowed. This is following the Tamil Nadu government’s move circumventing the Supreme Court ban on Jallikattu (bull taming) by promulgating an ordinance and later replacing it with a law. Sources in the government said the Primary and Secondary Education department is preparing a draft bill that seeks to make the question paper leak of public examinations a criminal offence. The department is planning to bar students who are caught buying, selling or transferring leaked question papers, from appearing for exams for five years, besides slapping a fine of Rs 5 lakh on them. It wants to amend the Karnataka Education Act, 1983, for this purpose. But it is not clear whether the government will introduce the amendments in the ongoing legislature session.